This is a Reduced Scientific Report resulting from NERC Geophysical Equipment Facility Minor Loan 1064, principal investigator Dr Matthew Balme. The first aim of this project is to study the Árnesfjall landslide (Fig.1) that occurred in summer 2014 in the Westfjords of Iceland, and whose main triggering factor is thought to be the degradation of ground-ice. Our aim is to compare the Árnesfjall landslide with a similar rapid mass movement, the Móafellshyrna landslide, which was the case study for our previous GEF minor loan 1048. 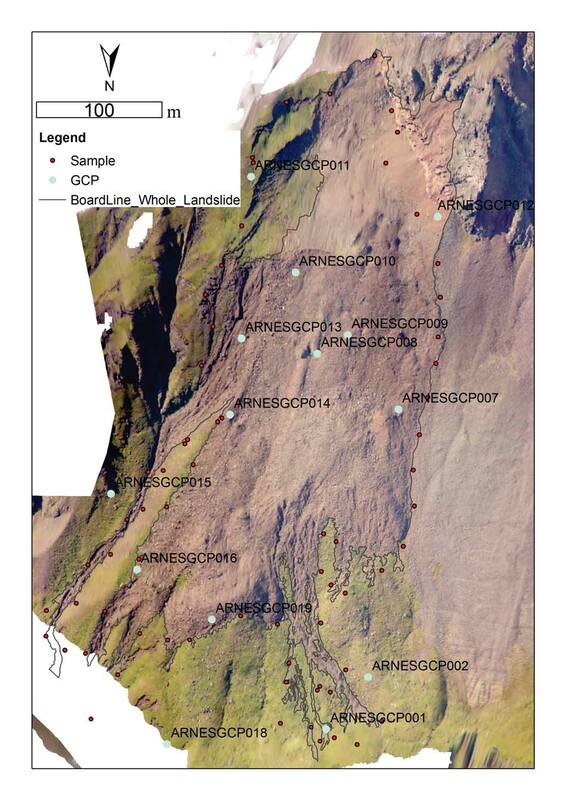 The second case study of this research is the monitoring of debris flows on the slope above the town of Ísafjörður in the Westfjords of Iceland (Fig. 2). Our study is aimed to characterize the nature of the debris flows affecting the slope of Ísafjörður and to quantify the volume of material that they can mobilize in a short range of time (2013-2016). For both case studies, we collected photographs in order to compute Structure from Motion (SfM) elevation models. To do so, we used as a survey technique GNSS post‐processed kinematic (PPK) to provide Ground Control Points. For Árnesfjall landslide, we also mapped the extent of the landslide's deposits using PPK. This new dataset has allowed us to quantify the volumes of material involved during the Árnesfjall failure and fully characterize the mobility of the landslide. In the case of the debris flows above Ísafjörður, we will combine our new dataset with the airborne data (i.e., high resolution aerial photography, LiDAR data) collected by NERC ARF in summer 2013 in the same area, in order to monitor the changes induced by the debris flow between 2013 and 2016 and to better characterize the potential hazard that they pose to the slope of Ísafjörður. Permafrost degradation can affect slope stability, but how thawing ground ice can condition the dynamics of rapid mass movements is still poorly understood. In July 2014, a debris slide occurred on the Árnes Mountain in the Westfjords of Iceland, mobilising ~360,000 m3 of debris. Immediately after the event, the discovery of ice-rich blocks and sediments in the landslide deposits gave rise to the hypothesis that one of the main triggering factors for the landslide was permafrost degradation. The melting of shallow ground-ice in mountainous areas with discontinuous permafrost is a ‘hidden hazard’, being a phenomenon difficult to detect and characterize and one of the less understood causes of many recent landslides in northern Iceland. In this project, we aim to study the characteristics and causes of the Árnesfjall slide and then compare this knowledge to another similar landslide that occurred in northern Iceland in summer 2012, the Móafellshyrna landslide. In order to obtain a sub-metre resolution elevation model and orthophotos of the landslide. We used the Structure from Motion (SfM) photogrammetric technique (Westoby et al., 2012). In order to apply the SfM technique, we needed the accurate position of at least 10 Ground Control Points (GCPs) . Thus, we used the GEF's GNSS Leica VIVA GS10 System to collect 19 GCPs (Fig. 1) using natural features such as boulders 2-3 m high, and in addition we surveyed the perimeter of the landslide (comprising 68 GPS sample points). For each of these surveys we used a rover GPS unit to collect the position of the sample points and a base station placed within the landslide body to provide differential correction (always within 1km of the rover) - both recording at 1s interval. Slopes in fjord environments of Iceland are prone to debris-flow initiation, and they are frequent on the slope above the town of Ísafjörður (return period of debris flows-events is 4-5 years; Decaulne et al., 2005). A debris flow is a fast-moving body of poorly sorted debris material, mixed with water and/or air, which moves down-slope because of gravity. Therefore, debris flows can be a serious hazard if occurring in inhabited areas, and require monitoring for monitoring and prevent this hazard. The aim of our project is to produce a sub-metre resolution elevation model and orthophotos of the slope above Ísafjörður, and to compare this new dataset, with the information we already have from aerial photography, and LiDAR data collected in summer 2013 by NERC ARF. To produce the new dataset, we used SfM technique, and we collected 12 GCPs (Fig. 2) using natural features such as boulders visible from the other side of the fjord (2.5km distant). We used a rover GPS unit to collect the position of the GCPs and a base station placed at the foot of the slope to provide differential correction (always within 1km of the rover) - both recording at 1s interval. The field campaign started on 27th June 2016 and finished on 11th July 2016. On this loan we used the Leica VIVA GS10 GNSS for supporting the production of the SfM elevation models of the Árnesfjall landslide and of the slope above Ísafjörður. The SfM elevation model needs Ground Control Points in order to derive rotation, translation and scaling parameters. In one day we collected 19 GCPs in Árnesfjall and 12 GCPs in Ísafjörður (Fig. 1-2), recording each point for at least 2 minutes. We stopped surveying whenever GDOP exceeded 5.0. GCPs were collected over the whole area of survey, at different altitudes and in different positions; therefore, we sollected GCPs over big blocks, along the road and near buildings for being easily identifiable during data processing. We generated an elevation model with 18 cm/pix resolution for Árnesfjall, and with 1.17 m/pix for Ísafjörður. We also surveyed the perimeter of the Árnesfjall landslide for obtaining the accurate position of the runout zone, logging data when the rover was static and moving, with a record rate every 1 second. We recorded a sample every 20-30 m, recording for at least 10 epochs (seconds) every sample. We collected in total 68 samples in one day. To compare out new dataset with the airborne dataset collected by NERC ARF in 2013 on the slope of Ísafjörður, we tied our base station into the local network with the permanent GPS station of Ísafjörður (data from Icelandic Meteorological Office). At the end of each day, data from the base-station and rover were downloaded and post-processed tying the rover data to the base station data. At the end of the fieldwork ,the post-processed data were exported to ArcGIS. Then, these data were exported in Agisoft Photoscan Pro together with the photograph datasets, in order to build the SfM elevation data. GPS data were therefore used to provide georeferencing information for the 3d model and as check-points for model accuracy. The Leica VIVA GS10 GNSS System allowed us to perform accurate measurements of the perimeter of the landslide (average accuracy of samples is around 1cm in plan and 2cm in height). Without the use of the collection of GCPs using the Leica VIVA GS10 System it would have not been possible to produce the digital elevation model and the orthomosaic for our field sites. For Árnesfjall, we produced a DEM with 18 cm/pix resolution, and a orthomosaic with 9 cm/pix resolution. This datasets is currently being used to perform measurements of the morphometry of the landslide and of important landforms that generated within the landslide's deposits during the failure (i.e. molards). We have compared this datasets with the one collected in summer 2015 for the Moafellshyrna landslide. We found and characterised important landforms that are present in both landslides. These landforms, called molards, reveal permafrost degradation and can be used to identify different landslide processes. For Ísafjörður, we produced a DEM with 1.17 m/pix resolution, and a orthomosaic with 29.2 cm/pix resolution. Relative vertical displacements of the DEM will be calculated, and volumes of deposition and erosion calculated by the comparison with the DEM produced from the LiDAR data collected in 2013. The data are backed up on the Open University and research group servers. Once the data have been processed and published they will be made available on request. Decaulne, A., Sæmundsson, Þ. and Petursson, O.. Debris flow triggered by rapid snowmelt: a case study in the Gleiðarhjalli area, northwestern iceland. Geografiska Annaler: Series A, Physical Geography, 87(4), 487-500 (2005). Milana, J. P. Molards and Their Relation to Landslides Involving Permafrost Failure. Permafr. Periglac. Process. 27, 271–284 (2016). Westoby, M. J., Brasington, J., Glasser, N. F., Hambrey, M. J., & Reynolds, J. M. (2012). ‘Structure-fromMotion’photogrammetry: A low-cost, effective tool for geoscience applications. Geomorphology, 179, 300-314. Figure 1. Orthomosaic of Árnesfjall landslide, built with SfM technique . Green points mark GCPs used for SfM, red points (samples) mark the surveyed perimeter of the landslide, marked with the grey line .